‘Invasion of the Triceratons,’ Part 5 of 5. Lines have been crossed, and New York teeters on the brink of complete destruction! When the times comes, will the Turtles be able to defeat the enemy they dread to fight? The devastating final chapter in the blockbuster ‘Invasion of the Triceratons’ story arc! 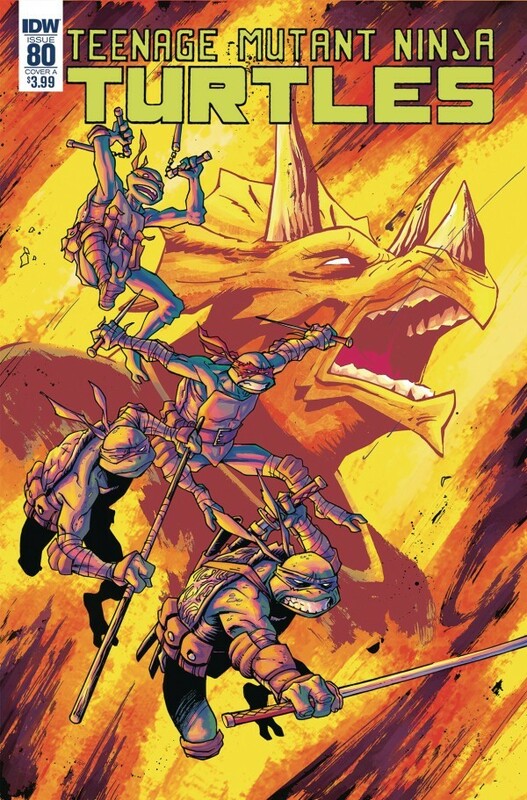 A good conclusion to the arc, and the TMNT and the Triceratons all finish with some honour. The problems between the brothers and Splinter are going to come to a head soon (although I think that may happen in about 20 issues) but this had a nice little tease as to what is to come. Baxter was well dealt with and the solution had a nice finish to it, which can be revisited at a point in the future. The ending was very clever and something popping up that I hadn’t thought of and had missed! There are some excellent fight scenes here, both on the street and more violent, plus the ninja battles between the TMNT and the Foot!